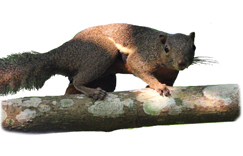 Plantain squirrels are part of the rodent family. The ACRES Wildlife Rescue Centre provides a safe sanctuary for reptiles and amphibians rescued from the illegal exotic pet trade here in Singapore. It is illegal to sell, advertise for sale or keep all of these species below as pets in Singapore. Many of these animals have been found abandoned, whilst others are handed over to us by their owners. Read on to learn all about the special animals whose lives have been transformed with your support. 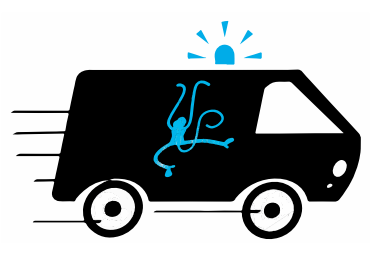 In the future, the AWRC will also be able to take in mammals. However, due to problems with the construction of the Main Sanctuary Area of the AWRC, we cannot house mammals at this time. In 2009, ACRES commenced a suit in the High Court against the main contractor (ANA) and its director, who was the site supervisor for the construction of the AWRC, in relation to, amongst other things, the delay in the opening of the AWRC. As of 31st August 2010, ANA Contractor has been ordered by the High Court to pay damages to ACRES, and Justice Kan Ting Chiu ordered a separate hearing before the Registrar to assess the amount of damages ANA should pay ACRES. Meet some of our beautiful star tortoises! Sadly, their beauty has been the downfall of this species. Their striking shell patterns have made them very popular as pets, and they are rapidly disappearing from the wild in their native India, even though it is illegal to take them from the wild. 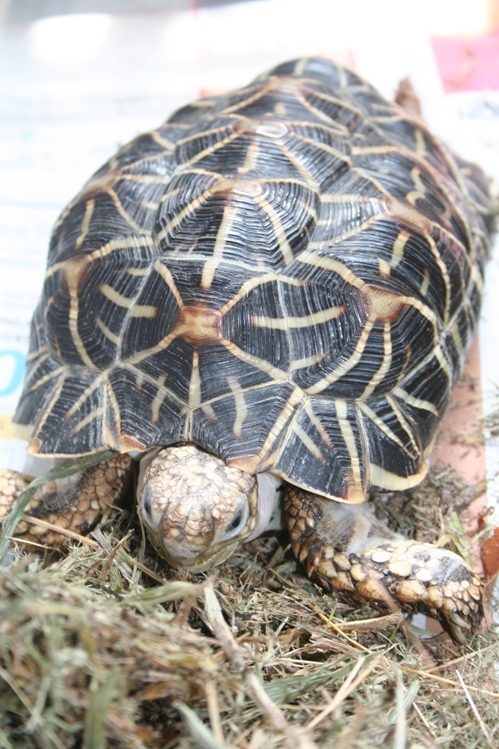 Star tortoises have been smuggled in their hundreds and thousands into Singapore to be illegally sold as pets. 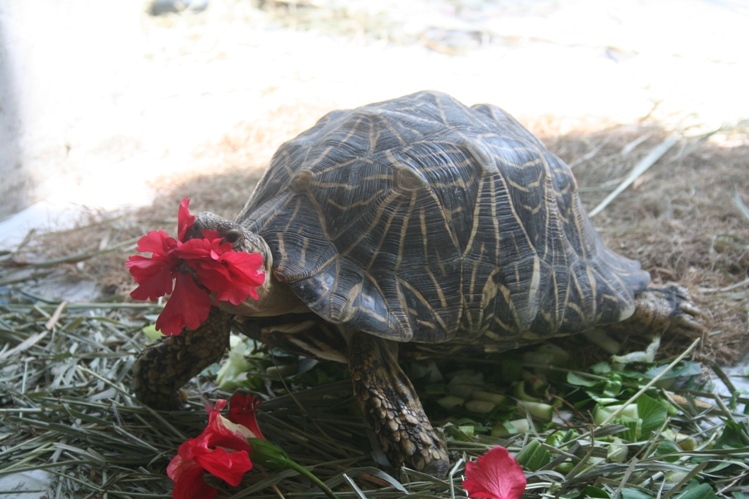 Star tortoises are adapted to live in arid climates and are not suited to Singapore’s humidity- one very good reason why they should never be kept as pets in the topics. That’s why we’re planning to send our rescued star tortoises back home to India, where they will live in sanctuaries and hopefully even go back to the wild! Princess Leila has the honour of being the first ever wild animal to arrive and be housed at the AWRC! The way she came to us was not so honourable though- cruelly dumped in a bag by the front gate the day after the AWRC opened. 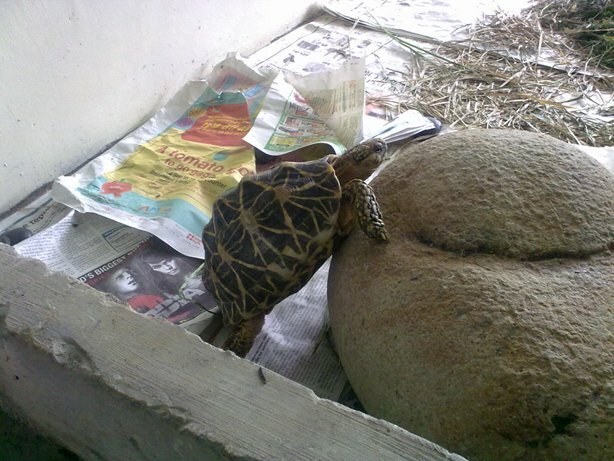 Like all the star tortoises in our care, she would have been smuggled into Singapore as a baby- perhaps stuffed in a suitcase with hundreds of others- to be illegally sold as a pet. Sadly, Princess Leila has shell deformities, most likely as a result of poor nutrition and lack of space to exercise in her former life as a pet. As a result she can never go back to the wild, but we will make sure she will always have a safe and comfortable home, either here or in India. Princess Leila loves to bask in the sun on her pebble patch in the afternoons and enjoys devouring cactus, endives and hibiscus leaves! These four little stars arrived at the AWRC together having been found by a member of the public, abandoned in a park. The four fully-grown adult males, named Sirius, Spica, Vega and Ankaa after the stars, quickly settled in to in their new surroundings. Their enclosure keeps these active little fellows busy all day, whether they are eating, hiding or cooling off with a soak in their water trays on a hot day. Each has their own hideaway spot which they disappear into at nights. The caregivers particularly enjoy observing this little gang because of the various behaviours they display, particularly their running around and exploring any new item in the enclosure- Sirius is especially active and nosy! They don’t come much cuter than Tiny Tot and Boris! Smaller than the palm of our hands when they arrived at the AWRC, Tiny Tot and Boris are the smallest reptiles we have ever rescued! They were found abandoned, inside a paper bag, in a park. It is always shocking that people abandon animals to their fate in this way, but luckily for these two little ones a member of the public found them and called the ACRES Wildlife Rescue Hotline. Named Tinytot (because of his extremely small size) and Boris, they are now enjoying exploring their interesting enclosure and love chomping away on their greens. 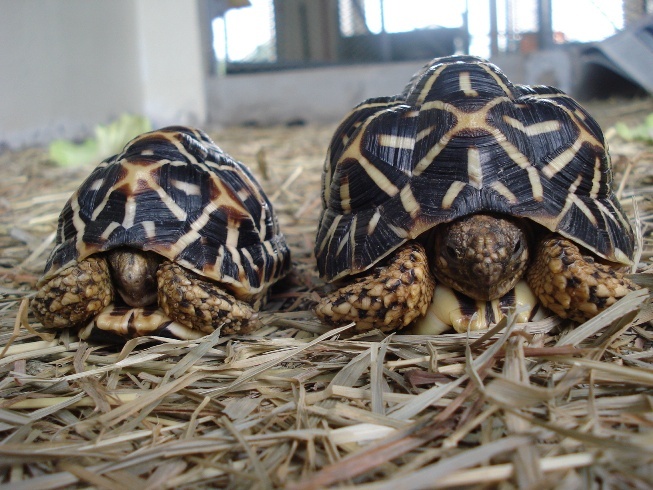 From their very small size, it seems that both tortoises had only recently been smuggled into Singapore to supply the illegal exotic pet trade, sometime in 2009. All tortoises have hard shells right? Sadly, not so for Spongebob when he came to us. 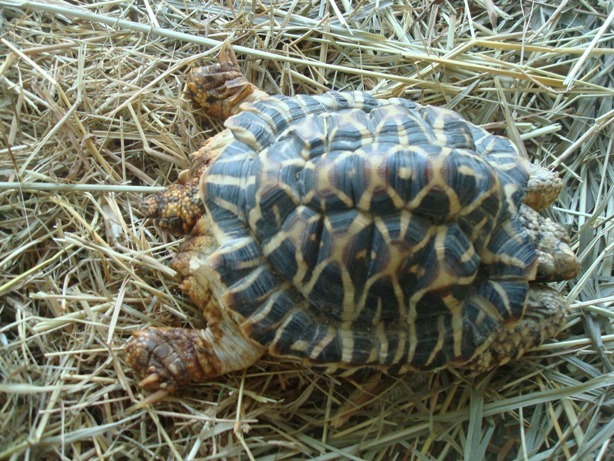 His shell was as soft as a sponge- a result of severe calcium and vitamin deficiencies. And it wasn’t just his spongy shell that made Spongebob a very poorly tortoise- he also had badly swollen, cloudy eyes because of his poor diet. As if that was not bad enough, someone had cruelly dumped Spongebob in a trash bin. After months of specialised care, vitamin injections and a custom made cushion-soft environment that would not damage his delicate shell, Spongebob is now fit and strong and is able to climb and explore once again. He is ready to head home to India! “The day Spongebob arrived at the AWRC he was in such bad shape I wondered how we were going to get him fit again. I was worried whether he would even eat! But he has proved to be such a fighter- he was out of critical care after just a few months. Every time I see him walking around, or basking under the sun and chomping his flowers and plants, I hope that after all he has been through he can even ultimately go back to the wild!” says Anbu, Director of the AWRC. Poor old Big Momma was found wandering around a rubbish dumping site looking very lost. She had probably been dumped there to fend for herself, or perhaps abandoned nearby and had wondered into the dump site in search of food. Luckily someone found her, and the ACRES wildlife rescue team was soon on its way to pick her up and give her the help she desperately needed. Big Momma didn’t want to eat for several days after arriving at the AWRC and our veterinarian Megan soon discovered that Big Momma was gravid (carrying eggs) and was also suffering from severe nutritional deficiencies, which was probably making her feel very unwell. We think she probably hadn’t eaten proper food for a long time. We provided nesting conditions for her and she soon laid two eggs, which we broken as a result of her nutrient deficiencies. After laying her eggs Big Momma quickly brightened up and began to recover from her ordeal and has a great appetite now! 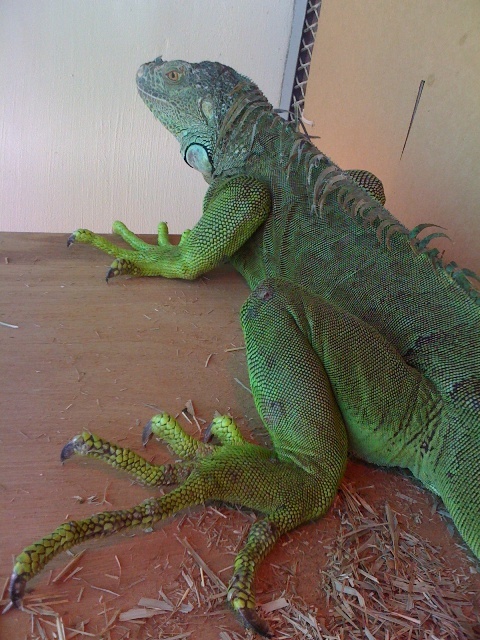 She enjoys basking in the sun and exploring her enclosure in the morning and resting in the afternoons. Pig-nosed turtles are almost exclusively aquatic freshwater turtles, found in rivers, streams and lagoons in lowland Papua New Guinea (New Guinea and the Indonesian province Irian Jaya) and the Northern Territory, Australia. In Australia, pig-nosed turtles benefit from State and Federal legislation prohibiting the exploitation of native fauna, and export is prohibited. In Papua New Guinea (PNG), the trade of turtles is strictly regulated by law, and all exports of turtles require permits. The pig-nosed turtle is listed as a restricted species with narrow guidelines limiting any legal export to only a few animals for legitimate scientific purposes. However, it is also known that animals are illegally traded from PNG to Irian Jaya from where they enter the illegal pet trade. 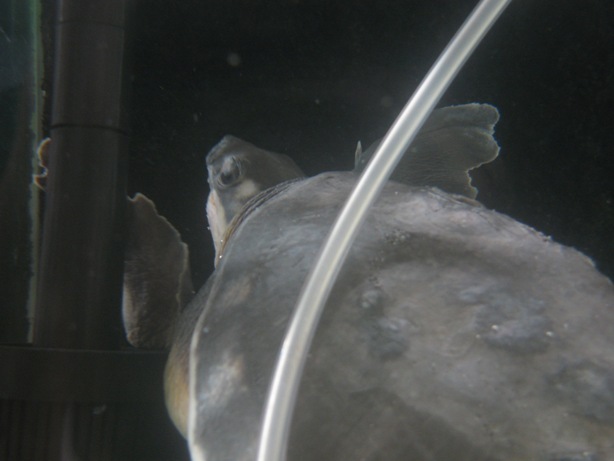 In captivity, pig-nosed turtles need very clean living conditions to keep healthy and are extremely prone to fungal infections, which can prove fatal. They are not at all suited to being kept as pets. Leafy greens, fish, worms, fruits – these are all things that pig-nosed turtles need to eat to keep healthy. Unfortunately, some people who keep turtles as pets think that fish food is good enough food for them and Kermit, who was handed to us after being kept as a pet, had been fed a completely inappropriate diet of koi pellets, resulting in him having severe nutritional deficiencies. To get Kermit fit and well we had to slowly wean him off of his fish food and introduce lots of healthy veggies and other exciting new foods into his diet. Kermit enjoyed the fish and worms straight away, but getting him to try his veggies was a different matter! He was very reluctant to try anything remotely green at first, but he soon realised veggies are not all that bad, and you can now find Kermit happily munching on his greens- especially enjoying feasting on endives, spinach and aquatic vegetation! A graceful swimmer, Kermit enjoys making the most of the large space to swim that his new home at the AWRC provides, but it is not always easy for our caregivers to spot him as he likes to hide in the vegetation! Toblerone was kept as a pet for about nine years before his owners decided it was in his best interests to hand him over to the care of ACRES. Unfortunately, help almost came too late for Toblerone, who was in terrible physical condition when he arrived at the AWRC. Like so many other turtles misguidedly kept as pets, Toblerone had been fed a totally unnatural diet of pelleted turtle food only, and a lack of proper fresh food had caused serious health problems. Our caregivers worked patiently to encourage him to eat healthy greens such as kangkong, spinach and water cress, but- like a stubborn toddler- Toblerone resisted eating his veggies for a long time! He slowly started to show more interest though, swimming around his greens with curiosity and eventually taking a nibble here and there! Why the name Toblerone? 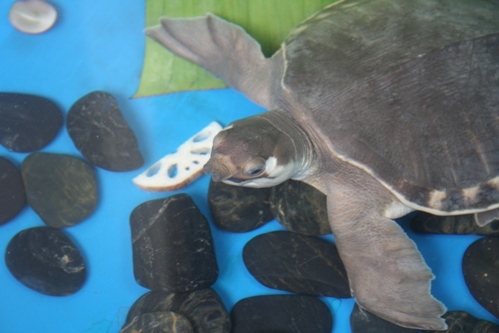 Well, Toblerlone has very prominent triangular markings on his shell, reminding us of a certain brand of chocolate! These large carnivorous freshwater turtles, native to the Americas and Southern Canada, are a force to be reckoned with! As their name suggests, these turtles will defend themselves or catch their prey by striking with lightening speed and snapping their jaws shut. If you are unlucky enough to be in the line of fire, their sharp-edged, cutting mandibles and jaw muscles of tremendous power will do a lot of damage. These turtles are certainly not suitable pets! 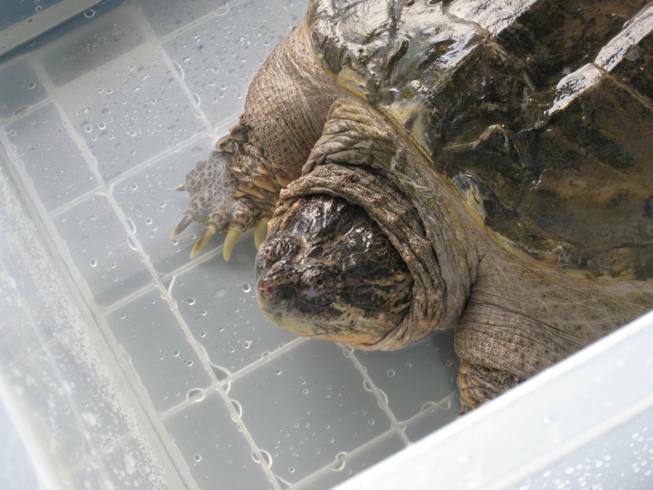 Before finding a home at the AWRC, Tyrant was kept as a pet for two years, in a tiny, filthy tank- just two times his length long and just a little bit wider than his shell- meaning he couldn’t even turn around. With only two inches of water, he couldn’t even act on his most basic instinct to swim. It was a very miserable existence indeed. Fed a diet of only koi fish pellets when we found him, instead of the meat and fish that he needs, Tyrant was in desperate need of rescue and a new home and proper food, and his owners agreed to hand him over to us. Now in our care, Tyrant enjoys a much larger living space where he can swim freely and also a proper, healthy diet. We have to be extremely careful of his powerful jaws when handling and working around him!. Native to Central and South America, these large, primarily herbivorous lizards live in the forest canopy. Extensive capture for the pet trade has reduced wild populations of these magnificent prehistoric-looking creatures. Midori was discovered roaming around an industrial estate in Singapore- a long way from the South American forests where he belongs. Unable to find proper food for a long time, Midori was dehydrated, thin and covered with sores and mouth ulcers when we rescued him. It became evident that he’d been forced to raid trash bins for food when he excreted a razor blade in his faeces soon after his rescue. Midori remained in critical care receiving special treatment for many weeks and didn’t want to eat for a long time, probably because his mouth ulcers made eating so painful. Whilst he was recovering, our Animal Caregivers set to work making Midori’s new home as comfortable as possible for him, fixing up lots of furniture for him to climb and platforms to rest on, branches to rub himself on, water to soak in and plenty of nice warm sunny spots for him to bask in! Today, as well as enjoying his new surroundings, Midori enjoys feasting on fresh vegetables and fruits and pulling the flowers from the fresh twigs we give him daily before chomping them down. Midori is a feisty character- wild through and through- and we hope he can return to the wild one day. “Every morning I wake up looking forward to my animal care duties. Seeing Midori putting on weight and eating the fresh food that I’ve prepared for him, silently glancing down at me from his high resting platforms, is the priceless thank you that I wake up for every morning” says Zan, Animal Caregiver.